Omnicom's OMD has been named the most-awarded media agency in the world, ahead of Publicis Groupe's Starcom MediaVest Group and its sister shop PHD, in The Gunn Report For Media 2014. The report compiles winners’ lists from key media awards. It included contests in 42 markets in 2014. OMD had a strong performance all over the world. Its most-awarded units include OMD Singapore, for "happier mornings with McDonald’s," and OMD UK, for McDonald’s "FryFutbol," Pepsi Max "unbelievable" and Sony PlayStation "for the players." In second place is SMG, led by its US division for work on brands including Mondelez International’s Trident and Oreo, Microsoft, Samsung, Pantene and Heineken. Other star offices include Poland, United Arab Emirates and Egypt. PHD joins the top three for the first time, up from fifth place last year, helped by four gold Media Lions in Cannes. The London agency landed awards for "The Lego Movie ad break," Sainsbury’s "Boredom Busters" and Harvey Nichols "sorry, I spent it on myself." 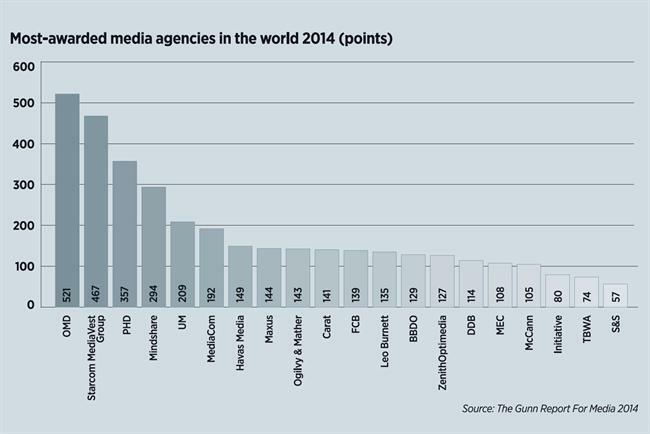 The most-awarded clients in 2014’s media categories were Coca-Cola, McDonald’s, Samsung, Heineken, Nivea and Ikea. The UK was named the second-most-awarded country, after the US and ahead of India. Canada and France came fourth and fifth respectively. The 2014 report highlights that media agencies are entering – and winning – more awards than ever before, including in the non-traditional realms of PR, promotion, direct, effectiveness, cyber and branded content.